Wholesale Monitor Stand Sized for 37" LED TVs On Sale! This Monitor Stand is Heavy Duty! Buy Online Now! 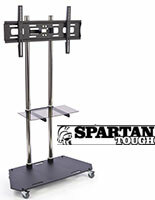 Mobile TV stands designed for 37"-60" LCD, plasma, or LED television, weighing up to 176 lbs. Heavy duty flat panel displays ideal for rugged use at trade shows. Lockable wheels of mobile TV stands perfect for transport & stabilization. VESA compatible for 100mm x 100mm, 200mm x 100mm, 200mm x 200mm, 300mm x 300mm, 400mm x 200mm, 400mm x 400mm, 600mm x 400mm, 800mm x 200mm, & 800mm x 400mm. 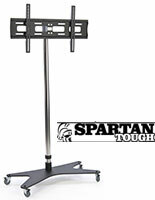 The heavy duty mobile monitor stands are constructed for durable steel. The rugged design of this adjustable flat screen mount makes it ideal for use at trade shows and other temporary events. The adjustable plasma mounts ship unassembled and include instructions and tools for fast assembly. 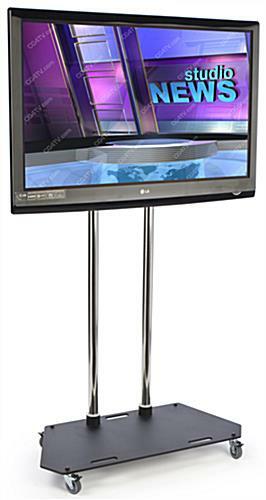 The LCD television stands are ideal for setting up around furniture in a trade show booth for patrons to relax at. 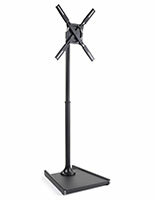 These flat panel monitor stands offer a high quality unit to present potential clients with your business information! These mobile monitor stands are height adjustable to allow users to display their LCD monitor at the best viewing level. The flat screen displays feature a tilting bracket as well. The mobile monitor stands with tilting bracket, also known as adjustable television furniture, allows angling of the television to provide an optimum viewing experience. This mount is VESA compatible for 100mm x 100mm through 800mm x 400mm. VESA brackets are standardized to fit most television brands including Sony, Toshiba, and LG. The monitor stands are portable and include locking wheels for easy movement. These casters allow for easy maneuverability, as well as stability once in a desirable location. 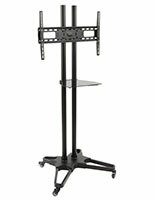 The mobile monitor stands that hold a 37"-60" that weighs up to 176 lbs. include the necessary hardware to attach most flat panel monitors to the mount. However, some LCD televisions may require special screws that are available at most hardware stores. 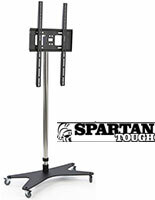 Buy these inexpensive monitor stands with bracket for 37"-60" flat panel TVs online now!